Communication is essential if players are able to work well as a team. Often it’s impossible for the player in possession to know exactly what’s going on around him. Clear, concise directions given by a team-mate in a good position to judge what’s happening is invaluable help. 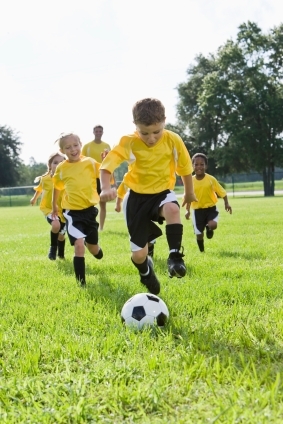 Young players new to soccer, especially under 8’s or under 10’s, are very quiet on the field. This might be likely due to the fact that they’re learning the game and don’t feel confident. Even the shyest players can develop an on-field persona in which they are vocally very aggressive and dominant. This is especially important in the goalie position. If you have a quiet child as your goalkeeper, gently encourage this player to shout directions not for the point of being loud, but to help his or her team. The goalkeeper is often in the best position to see and advise. He’s also responsible for most of the play going on in the back third of the field and it’s from this position that he should take command. But defenders are only willing to receive and carry out instructions from the goalkeeper without hesitation if they are clear and confident. The keeper must work to earn the respect of his defenders if they are to have confidence in his judgment. He should leave no player in any doubt as to what he wants to take place. Instructions given in a firm and definite tone have a strong psychological effect not only on the defenders but on the opposition as well. The referee can penalize an instruction that purposely tries to distract opponents so it’s safer to call a name or something like ‘keeper’s ball’, when as a keeper you are indicating that you are leaving the goal-line to make contact with the ball. You want a clear space from defenders and cover should you make an error. Defenders in the immediate playing area should react automatically by getting out of your way and moving towards the goal-line to give the cover. This kind of chemistry is only developed through time. A defender being chased by opposition while chasing a ball towards his own goal can be in a tricky position. As you move out you must decide whether you want the defender to play it back or leave it for you to come out and pick it up. Again, be positive because you’re in the best position to read the situation. Call ‘play it’, ‘leave it’ or ‘keeper’s ball’ depending on what you want the defender to do. Free-kicks also require definite instructions from the keeper. First, you must decide whether or not you want a wall and if so how many players you want in it and where they should stand. Second, you must make sure that all attackers are marked coming into the penalty area. A shout of ‘cover him’ while pointing at the opponent is all that’s necessary. Instructing players to ‘move out’ when the ball is cleared or for a fullback to ‘cover’ are also instructions that a goalkeeper can give because his position gives him such a wide view of the action. An understanding between the goalkeeper and fellow defenders will not just happen. A lot of work will have to take place during soccer drill sessions. In games of attack versus defense the goalkeeper can be encouraged to dictate certain situations. Talking is a major part of soccer. Remember to keep your calls short and to the point. Be clear, intelligible, loud and positive.